We all know that families have been taking youth sports more and more seriously in recent years. This trend toward competitiveness tends to help our businesses. The most dedicated athletes are usually our best clients — they’re happy to spend on quality training for elite skills. But the pressure to perform younger and more frequently can come with a greater risk of injury for athletes. A recent study picked up by the Washington Post seems to confirm this. The study, released at the end of 2016, tracked lower extremity injuries in high school athletes who specialized in a sport. It found that athletes who specialized — defined as the neglect of other sports and pursuits to train for one — were twice as likely to report a sports-related injury than their non-specialized peers. As the leader of your sports academy, here’s what you need to do with this and other findings that suggest limiting single-sport play. These days, coaching credentials need to go much farther than a winning record or a professional career from the distant past. Sports science changes. You don’t need a degree in exercise science, although it helps. You DO need a way to show that you’re up on the latest research and best practices for injury prevention for your sport. That could mean simply communicating with your clients about what you’ve learned recently. It could also mean keeping up an official certification. This is especially important for those who host elite sports teams that encourage players to participate longer than a typical season. Some of you already have an injury prevention plan and are passionate about training kids to avoid getting hurt. However, if you haven’t communicated those things to parents, it’s not doing much to help your business. Parents might not even know that they need to worry about this issue — and they should. Let them know that specialization has risks, but that you’re aware of them and you’re doing what you can to reduce them. The safety of your program should be a marketing highlight. Show that you’re the most qualified program in your area to offer elite sports training in a way that protects their kids. 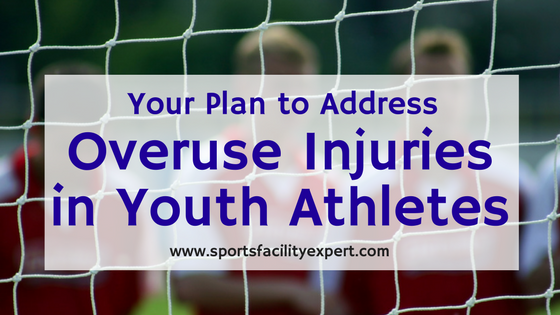 Maybe you already have a plan to reduce injury for your own athletes. You can also help athletes from other teams reduce their chances of injury. Many of you are already doing this by offering classes that teach kids proper running technique, deceleration technique, change of direction technique, landing technique and more (I did this at my own facility through a Parisi Speed School franchise location). You may also offer strength training that’s tailored to a sport, such as the pitching velocity program we ran at DNA. Use this injury data to educate parents that they should come to your facility more, not less. Training is key. (For a great example of how one of my eSoft Planner clients communicates this message to clients, read his recent blog post). Overall, specialized athletes spend too much time playing and not enough time training and studying. Anthony Yacco of 4D Sports Performance Center, another eSoft Planner client, starts each practice with lesson. Players study the biomechanics and science behind what they need to do to improve. After these lessons, players start practices focused and energized — and they can play more safely, too. It’s up to us to protect our athletes from the risk of overuse injuries. If you have other suggestions on how you are addressing this issue at your sports academy, please leave a comment.